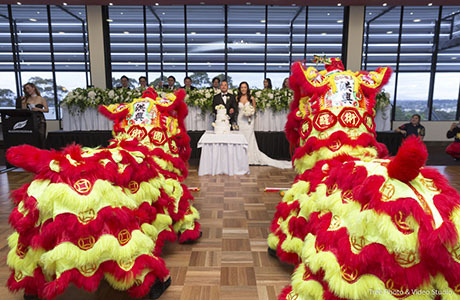 Manningham Function Centre is wedding reception venue located 12km from the Melbourne CBD. It sits on top of the Doncaster Hill and enjoys the panoramic views from Mt Macedon to Dandenong Ranges. With the capacity of up to 400 people to have a sit-down dinner and the modern amenities, it is one of the best wedding reception venue for large and luxury weddings. Opened its door in August 2001, Manningham Function Centre is purpose-built to accommodate a wide variety of the events, especially the large weddings from a wedding photographer’s perspectives. When coming to Melbourne weddings, there are some communities such as Vietnamese, Macedonians, Lebanese, Italians and Greeks who normally consider a wedding with a quite long guest list. At Manningham Function Centre, the very spacious grand dining room with the parquetry dance floor, private bridal party lounge, flexible staging and modern visual audio equipment are all the magical elements for the large and luxury weddings. Manningham Function Centre provides an international catering menu for the wedding. This is also a true bonus in Melbourne as it is one of the most multi-culture cities in the world. The premium food and drink here provided can definitely pamper you and your guests through the whole wedding night. As a Melbourne wedding photographer, Manningham Function Centre is a perfect wedding reception venue for modern and large weddings on top of my list. Should you have any questions to plan a wedding at Manningham Function Centre, please do not hesitate to Contact Us for the suggestions and information from a wedding photographer’s view.